IS YOUR ENTIRE GARAGE FILLED WITH CLUTTER, WHILE YOUR CARS ARE EXPOSED TO THE ELEMENTS OUTSIDE? Create space for your cars today by organizing your belongings with durable shelving systems from Overhead Storage. Our garage shelving systems are designed and customized to meet the demands of your garage. You won’t find a more efficient or affordable garage shelving system on the market! Overhead storage racks are designed with heavy-duty steel frames and powder-coated in two colors (white or gray). They are adjustable to meet the desired height for your garage. All overhead rack installations are performed by a licensed, bonded, and insured contractor (905132). When you purchase garage storage shelves from Overhead, rest assured you’re receiving the highest quality overhead storage products available. Designed & customized to meet the demands of your garage, Overhead offers both stationary racks and roll-up heavy lift storage racks for maximum storage capability. All racks installed by Overhead tie into the ceiling joist system with bolts rated at 2000 lbs. to achieve a super-tough storage solution that keeps your floors free of clutter. Overhead Storage delivers and installs overhead storage racks throughout Arizona. All of our work comes with a lifetime warranty, and our installations are usually done within a few days, if not sooner. Need to get your canoes or kayaks up off the floor and out of the way ? Here is your answer. Call for details. What a great product and experience. Over the years I "built" my own overhead garage storage but decided in my new home it was time to get a professional solution installed. There are lots of choices out there but Overhead Storage of Phoenix absolutely has the best, and working with Charlie was a pleasure. ... highly recommend! This company is fantastic! I called and Charlie answered right away. He scheduled an appointment with me the following week, and the best part, you don't have to wait for install! Charlie has all the parts on his truck. He works fast and has great ideas to assist you with all your storage. High quality materials and very affordable. Got everything off the garage floor and out of the way. Now we don't have to worry about dirt and bugs getting into our stuff! Charlie is really friendly and personable and thoughtful in his designs. Doesn't oversell and only suggests what you need. You won't go wrong calling Overhead Storage of Phoenix. I spent a couple of weeks recently researching overhead storage racks and companies in Tucson, as that's where I live. I really couldn't find anyone very responsive, and if they were, the product just didn't seem like it would fit my needs. Somehow, when I did one last Google search for companies in Tucson, Overhead Storage of Phoenix popped up in the list. The product is leaps and bounds better than anything I had seen yet! 1000lb capacity? The deck is bolted down? Yes and yes! And they just looked sturdier than others. So I decided, what the heck, let me call and see if they service Tucson. Charlie answered, and said as long as I was looking to get at least two racks (preferably three), he would come down. I honestly didn't know if I had the room for three due to having existing shelving, and I let him know I might just need two (but I would like three if possible). He said no worries, and made me an appointment for just three days later! The night before, Charlie texted me to confirm our appointment, which was really nice as I'm kinda the type of person who likes constant contact from companies. Charlie showed up on time and was very kind. I showed him the mess I had in my garage, and right away he had a solution for me. He was willing to take down the old, cruddy shelving for me to make room for the third rack I wasn't sure about. That was perfect! He even made sure to stack the shelves neatly and put all the hardware to them in a nice pile for me. He was very respectful of my stuff and my home from start to finish. He installed three racks in about two hours, and that included taking down my old shelves. Awesome! I like that the shelves are in the joists in many different points, which adds to the stability. These things don't sway or move at all! I've had them now for about two weeks, and I've gotten everything from the old shelves and my storage unit on them, plus other stuff from inside the house, AND I still have space for much more! And everything looks organized and neat. I couldn't love them more! The cost of them is extremely fair for the quality and the professionalism and respect that Charlie will show you. The cost is only about 1.5 years of what I was paying for my storage unit, and I get to have my stuff in my own home! I love them and would recommend Charlie and Top Raxx to anyone and everyone! Thank you Charlie! 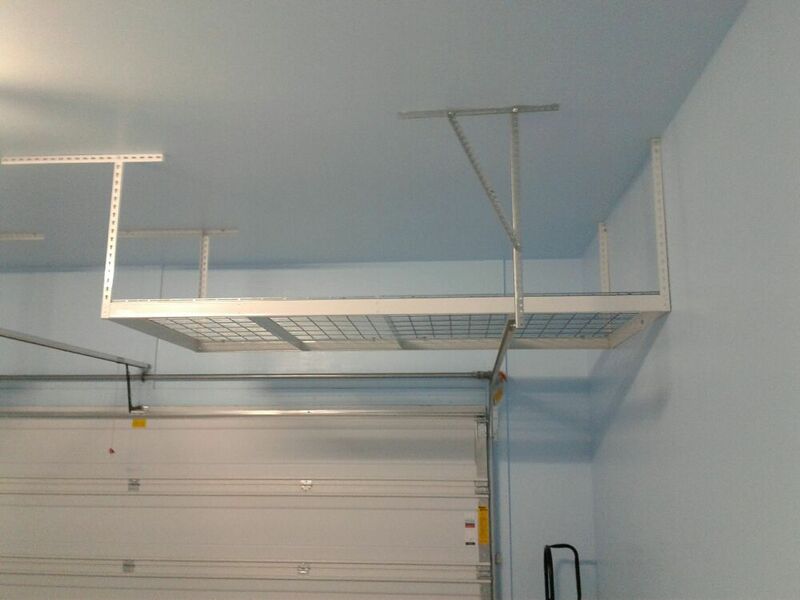 We Install the Best Overhead Garage Ceiling Storage Racks ! Find out why you should choose Overhead Storage of Phoenix to install Topp Rax brand heavy duty ceiling storage rack shelving as part of your garage makeover. Copyright © Overhead Storage of Phoenix LLC 2018. All rights reserved.